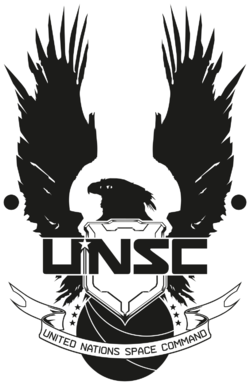 The UNSC Armed Forces are the military forces of the United Nations Space Command, consisting of the Air Force, Army, Marine Corps, Navy, and Spartan Operations, which serve as a joint air, land, and space force. Spartan Operations is the newest branch of the UNSC Armed Forces, commissioned for special operations after the Human-Covenant War. The UNSC Armed Forces were created during the Interplanetary War, fighting in a series of brutal conflicts across the Solar System and humanity's space confines between 2160 and 2164, most prominently among them the Jovian Moons Campaign, the Rain Forest Wars, and a series of battles on Mars. These encounters were centered around UN clashes with dissident political movements, the most important of which were the Koslovics and the Frieden. The war began with an attack on United Nations colonial advisers on the moon of Io, one of the moons of Jupiter, but would spread to Mars and parts of South America in the Rain Forest Wars. These events culminated in a UN build-up in the mid to late 2160s, which would result in the UN establishing a unified military and a permanent Unified Earth Government as an ultimate power to lead the human race by 2170. In the aftermath of the war, following the invention of the Shaw-Fujikawa Translight Engine in the late 2200s and the discovery of Slipstream space, the Unified Earth Government began a colonization programme that saw humanity spreading out from the Sol system. The apex of human colonization would come in 2492, when more then 800 worlds were inside UNSC territory and a handful of them were under development or had already developed into colonies. By this time, a ring of Outer Colonies was providing the UEG with the raw materials that made the macro-economy work; the political power, however, remained with the aforementioned Inner Colonies. The massive difference in wealth distribution and political power, which became a hallmark of humanity by this period, led to new threats of secession from the outer ring. Fearing the consequences of the breakup of the interstellar empire and seeing the benefits of avoiding all-out war to defend their hold on the colonies, the Earth government would establish the ORION Project in 2491. 2525 marked the most important turning point in human history; it would mark the beginning of the great technological advancement, the unification of a divided and fractured human race, and the first contact of humanity and an extra-terrestrial intelligence, the Covenant. It would also see a majority of the Earth government's colony worlds destroyed, and billions of colonists and military personnel slaughtered by orbital plasma bombardment and planetary invasion, known as glassing. Thus began the Human-Covenant War with the First Battle of Harvest. Intercepted communications identified the enemy as the Covenant, a caste-driven, theological organization made up of several alien species. The message "Your destruction is the will of the gods...and we are their instrument" was broadcast in perfect English. Since the later Second Battle of Harvest in 2526, where a huge human fleet led by Vice Admiral Preston Cole barely won against a smaller Covenant fleet in a symbolic "victory" for humanity, the humans' grip on their territories declined significantly in the course of their struggle. The Covenant had managed to capture the majority, if not all of the Outer Colonies, and a portion of the Inner Colonies. By this time, the UNSC had overridden the UEG, and thus the central civilian authority throughout the human worlds and Earth itself. Although the central government was more willing to step down, the Colonial Administration Authority was far more reluctant to this idea, and thus the UNSC stripped it of most of its power. By the middle to late stages of the war, the government of humanity could be more accurately described as an "emergency military" government. By 2552, the UNSC, outnumbered and outgunned, had managed to slow down the Covenant's inexorable progress through former human space, but the situation was dire. In desperation, HIGHCOM ordered a high-risk op, sending the Spartan-II supersoldiers, the best soldiers ever fielded by humanity, to insert into Covenant space, capture a high-ranking Prophet, and return to UNSC space in an attempt to ransom for a truce. Before the operation began, the Covenant attacked the planet Reach, killing most of the Spartans and a large portion of the UNSC Armed Forces, inadvertently stopping the operation and rendering most of the Spartans MIA. A single ship, the UNSC Pillar of Autumn managed to escape the planet. The ship followed coordinates derived by the AI Cortana to a ringworld known as Halo. There, the UNSC forces encountered a parasitic lifeform known as the Flood, the species that the ring, Halo, had been built to starve. The activation of the ring would lead to the extinction of all life within three radii of the galactic center. Spartan John-117 destroyed the ring, believing it to be too powerful, by detonation of the fusion drives of the Pillar of Autumn. After hijacking a Covenant flagship Ascendant Justice, the Spartan reunited with the remaining survivors from Installation 04 and the destruction of Reach and attacked a force of Covenant ships in Operation: FIRST STRIKE, one of the most successful UNSC operations against the Covenant in the entire war. By October of 2552, the Covenant had haphazardly discovered the position of the human home world, Earth, and sent a preliminary task force there, believing it to be the location of the Ark, an ancient Forerunner relic. They encountered staunch resistance, and were initially fended off. Further complications arose from the political and religious crisis that emerged in the wake of a UNSC operation to assassinate the Prophet of Regret, and the secession of the Sangheili from the hegemony, leading to the Great Schism, further throwing the Covenant into chaos. Nevertheless, by November, what was left of the Covenant had subjugated large parts of Africa in addition to devastating much of the planet. Only their retreat through a Forerunner portal in Africa, and the arrival of the Sangheili fleet, stopped the utter destruction of the UNSC and Earth itself. The UNSC and the Sangheili forces launched a joint operation to destroy the Covenant once and for all at the Ark, stopping the installation from firing the Halos, killing the Covenant's last remaining leader, the Prophet of Truth, and destroying the bulk of the Covenant's remaining forces. On March 3, 2553, the Human-Covenant War was officially declared over, ending in a victory for the UNSC and the Sangheili, but at a high price, with most major military outposts destroyed except for Earth. An estimated twenty-three billion human civilians were killed between 2525 and 2553. Following the end of the war, the UNSC Armed Forces were faced with new threats in the form of various Covenant remnants which arose to oppose humanity, the most prominent of these being Jul 'Mdama's Covenant. On many worlds, resurgent Insurrectionist movements also proceeded to resume their operations against the UNSC. In 2557, these irregular conflicts were joined by a new threat: the Didact, a renegade Forerunner Promethean who was accidentally released by Spartan John-117 on Requiem. Planning on digitizing all of humanity with a device known as the Composer, the Didact attacked Earth. The Master Chief was eventually able to defeat the Promethean commander, although not before the citizens of New Phoenix were enslaved. The Armed Forces take orders from the Unified Earth Government. The professional, controlling body of the UNSC Armed Forces is the UNSC High Command (HIGHCOM), headed by the UNSC Security Council. Within HIGHCOM are a number of administrative commands, including PERSCOM, the UNSC Medical Corps and the Engineering Corps. Committees such as the UNSC Ordnance Committee ensure quality in Armed Forces equipment and personnel. Additionally, all members of the Armed Forces are expected to follow the UNSC's Constitution. The UNSC Armed Forces comprise the Army, the Navy, the Marine Corps, the Air Force, and the recently formed Spartan Operations. Control of the Navy is exercised by the UNSC Naval Command, which contains UNSC Fleet Command, the Logistical Operations Command, the Office of Naval Intelligence, and the Naval Special Warfare Command. The UNSC Army and Marine Corps are administered by the Unified Ground Command. Within the Air Force are a number of major commands tasked with different administrative and operational roles. Among these are the Air Combat Command, which is tasked with gaining air superiority and providing support for ground forces, and the Air Mobility Command, which contains Air Mobility Express, assigned to airlift materiél and personnel during wartime. Operational control is exercised through regional CENTCOMs, which have responsibility over certain areas of space. After 2553, the Spartan branch was formed; it is responsible for command of special operations undertaken by the third and fourth generations of Spartan supersoldiers. The Spartans are the smallest operational component in the entire Armed Forces. As of 2540, the UNSC Armed Forces both conscripted personnel and accepted voluntary enlistment. It is unclear whether the draft was in effect prior to the Covenant War or if was instated later. The four major components of the UNSC Armed Forces, as well as the Office of Naval Intelligence, can trace most of their organizational and traditional lineage to the 21st century United States Armed Forces. The rank and unit hierarchies are almost unchanged from their American counterparts, though they have been adjusted to account for new formations such as the Orbital Drop Shock Troopers and the Spartans. Service, dress, and battle uniforms are generally similar in design to their forebears but feature design elements introduced in the intervening five centuries; some versions, however, are nearly identical to those of the US military. Many medals and ribbons have been carried over directly, though several new honors, such as the Colonial Cross, have been added. However, the UNSC Armed Forces feature some major differences from the US Armed Forces. The most prevalent difference is that non-commissioned officers, regardless of gender, may be addressed as "Sir"; an NCO with a command billet may even be addressed as such by service members of equivalent or higher rank, though this likely shows a measure of respect rather than protocol. In the US military, use of the term "Sir" was reserved for male commissioned officers. Marines are often addressed as "Soldier", both by outsiders and within their own ranks; in the USMC, referring to Marines as "soldiers" was considered taboo. Perhaps due to the universality of the term "soldier", Army personnel are typically identified as "Trooper"; this appellation is also given to Orbital Drop Shock Troopers. Various ballistic armor used by the Armed Forces in 2556. Unlike the Covenant, the UNSC Armed Forces' military technology is still based on comparatively primitive mechanisms - projectile weaponry, wheeled vehicles, and combustion engines. The UNSC Armed Forces' grasp of certain scientific concepts is more advanced than the Covenant, but turning these concepts into functional machinery has proven more problematic. Recently, the UNSC has introduced a variety of Covenant-derived technologies into their arsenal: gravity plating aboard ships, energy shields to protect Spartans, and limited use of directed-energy weapons, usually lasers, for example, the M6 Grindell/Galilean Nonlinear Rifle, though the Covenant still retain their technological advantage. UNSC starship weaponry is based around missiles and Magnetic Accelerator Cannons. Their technological inferiority in the face of the Covenant means that it was often necessary for the UNSC to have a three-to-one numerical advantage against them in ship-to-ship combat. The UNSC also possesses a weapon of mass destruction in the form of the NOVA bomb. The UNSC also appears to maintain a seaborne surface navy on planets with large bodies of water, such as Earth. At the very least, they had aircraft carriers available to provide air support in the form of Pelicans and F-99 Wombats. A UNSC assembly aboard the Cairo ODP. UNSC infantry on Installation 00. Various vehicles of the UNSC Armed Forces in Halo Wars. Concept art for Halo Wars depicting a UNSC armoured column supported by aircraft. Concept art depicting a UNSC military hangar. A poster in Noctus, Andesia urging people to join the UNSC in Halo 5: Guardians. ↑ It is possible, though unconfirmed, that "UNSCEF" stands for "UNSC Expeditionary Force(s)" as this would effectively contrast the defensive role of the UNSCDF, and match with the military assets with which the "UNSCEF" label has been associated (the uniforms of the crewmen of the frigate UNSC In Amber Clad and a UNSC Marine Corps M247 machine gun).